70% of all meetings held by DExEU ministers were with business representatives. 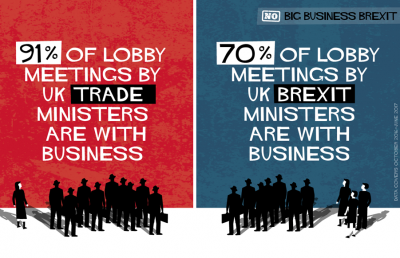 This figure may even just be the tip of the iceberg, as Brexit lobby meetings are also likely to take place, with DExEU officials not required to disclose meetings. A similar pattern emerges at the EU level, with 72% of meetings of Chief Negotiator Michel Barnier and his task force held with corporate interest representatives, with the finance sector as well as the food / agriculture sector dominating.